Madden NFL 18 review: "You’ll feel a sense of déjà vu creeping in after a dozen or so downs"
Madden 18 shines brightest with its new Longshot mode, but the lack of improvements elsewhere makes this year’s Madden offering an incremental – but still highly-playable – update. Madden 18 will divide opinion among fans of the long-running football franchise. Longshot mode, essentially a fully-stocked story mode, is a much-needed welcome addition – with a genuinely interesting narrative to boot – but, away from the flagship feature, the changes are mostly skin-deep. EA has wheeled out its rinse-and-repeat 12-month formula: in comes the annual lick of paint, and a smidgen of spit and polish. Yes, it’s still fun and yet it’s frustrating to see Madden take one gigantic leap forward in one department and stay still in others. If you’re a dyed-in-the-wool Madden player you’ll find a lot to like about this year’s instalment. Obviously. If not… you may struggle to spot the difference. The premiere attraction this year is undoubtedly Longshot. You are put in the shoes of university dropout quarterback Devin Wade, hailing from Mathis, Texas, and set out on a whirlwind journey that takes you from regional combines in Indianapolis, to reality TV shows and beyond. If you were expecting Longshot to borrow liberally from FIFA 17 and FIFA 18’s The Journey playbook, then you might be in for quite a shock. Wade’s journey often reaches dark territory and plays out more like a well-produced Friday Night Lights-lite than a cookie cutter rags-to-riches story. There are dead parents, friendship strifes, and cartoonish characters galore. Heck, even Oscar winner Mahershala Ali has a handful of appearances as Wade’s father, Cutter, even if he is criminally underused. The lowkey MVP of the mode, though, may just be fictional coach Jack Ford who pops up early on and really grows into his role as a warm, likable mentor. Unlike its FIFA cousin The Journey, Longshot doesn’t have you playing much actual football, as it takes a backseat to narrative and a few minigames which, admittedly, vary in quality. Thankfully, the story is excellent – you actually care about these characters – and the minigames serve as a crash course for newcomers on the ins-and-outs of football. Don’t know your safeties from your X-Posts? Neither does Wade to begin with, so picking up bits and pieces of game situation knowledge and improving your football IQ forges a link between the player and Wade in a smart, roundabout fashion that neatly ties together gameplay and character development. The non-football gameplay essentially follows a basic Telltale-style binary dialogue system – maybe you’ll want to goad Dan Marino or be super-reverent to the Super Bowl-winning QB – and a sprinkling of QTEs. It sounds like it shouldn’t work but it does. You’ll be rooting for Devin Wade for the entirety of the 8-hour runtime of Longshot and, frankly, EA Tiburon has bested FIFA’s Journey mode significantly. 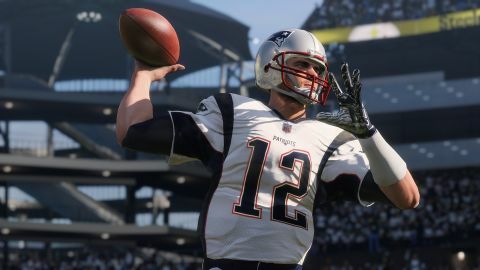 Aside from single-player Madden melodrama, EA has introduced three new game styles to better cater what we expect from a game of virtual gridiron. There’s Arcade, a simplistic style for those who want to throw 70-yard bombs and make OBJ3-esque highlight-reel catches (best suited for those new to the sport/franchise or a quick pick-up-and-play game with friends); Simulation, your bread-and-butter Madden experience and, finally, Competitive, the online-friendly style with an emphasis on bigger hits and even bigger tantrums. Most will stick to Simulation, but it’s nice to see EA opening up the game and making it accessible to rookies and e-sports hopefuls. It’s disheartening, then, that the majority of the other changes can be whittled down to a short paragraph, and therein lies Madden’s biggest flaw. Targeted Passing is twitchy, a click of the left trigger will open up a manual option to pass but you’ll more often look like Bortles than Brady when throwing the rock. 3 v 3 online team play is (finally) back, but integrated awkwardly into ‘MUT Squads’ so, if yours or your friends’ teams aren’t up to scratch then you’re going to be on the end of some heavy blowout losses, which isn’t much fun at all. Play Now Live – enabling you to play any 2017 NFL season game – is a ‘new’ feature that should have been put in many moons ago. Cosmetically, there isn’t much in the way of improvement either: a few nice, painstakingly-rendered details added to stadiums (the light glare sneaking onto the field from the window wall at the northern end of Lucas Oil Stadium will impress many a Hoosier) can only gloss over so much. In other words: you’ll feel a sense of déjà vu creeping in after a dozen or so downs. The football is as fun and frenetic as it ever was but the game, annoyingly after the successes of Longshot, drags its feet over wanting to add anything new and ground-breaking to spice up last year’s gridiron action. There are a few welcome tweaks – being able to set your own primary receivers for a route is like manna from pigskin heaven, and receiving in general has been given a boost – but this is offset by hearing the same tired commentary lines and in-game cutscenes over and over and over again. If I see Chuck Pagano kicking the turf in disgust one more time I will scream. Oh, and injuries are still liable to ruin your franchise season with their abundance of ankle sprains, busted collar bones, and other miscellaneous bumps and bruises. Let’s hope that gets toned down (again) in a patch. It’s hard not to think of Madden 18 as merely Madden 17.5. This is in no way as big of an improvement as last year’s effort was compared to Madden 16; annual sports franchise-itis (it’s a mouthful) looks to be setting in. It might not be terminal though. Longshot shows signs of a highly-promising, creative future, even if the gameplay is in danger of turning stale. It’s a slight shame that the considerable effort the team at EA Tiburon has put in for its story mode has seen the on-field action lose some of the spark that it dazzled us with so readily last year.